Another healthy, quick and easy supper - this can be on the table within half an hour. I can be a bit funny about cooking with cod as it is criminally overfished (along with so many others these days) so when I do cook with it I make sure I use sustainably sourced fish, and you should try to do the same. 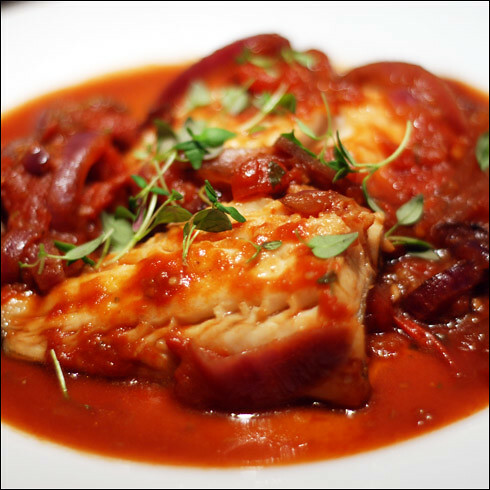 This recipe works equally well with other firm, white fish like Hake or Haddock, so do try those as alternatives. This will serve 2-4 people, depending on how hungry they are and what else you serve with it. I served this with tenderstem broccoli and new potatoes, so half a fillet per person was more than enough. Slice the onions, then in a large saucepan gently fry in a little olive oil until soft. Thinly slice two cloves of garlic, then fry with the onions for a further minute, until slightly golden. Add the chopped tomatoes, thyme leaves and soy sauce, and reduce by about a third, then season with salt and pepper. Chop the cod fillets in half widthways so you're left with four smaller fillets, then add to the saucepan and poach with the lid on for 10 minutes, until the cod flakes easily. Garnish with a little extra fresh thyme leaves. That's Good Look !! perfect posting for recipes. best info share and easy make tips posting.